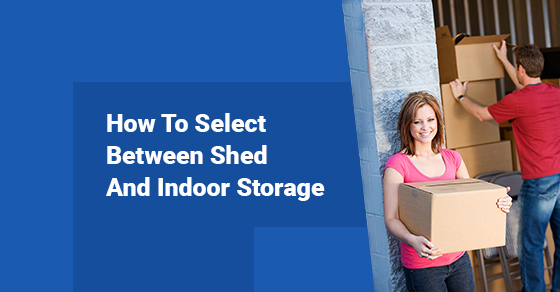 When considering storage options, most find that there are two main types of storage option available to them: shed storage and indoor storage. But without a clear understanding on the marketplace, it can be difficult to determine which storage option is right for your requirements. We’ll provide our expertise in this area within this latest post, as we address the differences between shed storage and indoor storage. A leading consideration when selecting your storage unit is temperature control. You will require a temperature controlled unit if you’re going to be storing items such as precious jewelry and expensive furniture or vehicles for any length of time. That’s because humidity and other environmental elements can have negative impact on your belongings and may cause damage over time. Shed storage options may lack this important level of temperature control and so oftentimes indoor storage is the leading choice. One of the many mistakes that homeowners make when looking for storage options is assuming that indoor self-storage is more-costly than simply building a shed and storing items themselves. Shed storage can be exceptionally expensive in terms of both materials and time to build the area. You may spend over a $1000 to build your shed, while the comparable storage facility fees might only be a few hundred dollars over many months. Many people choose to use storage sheds because they give the owner a semblance of control over what happens to their property. However, this isn’t always a clear advantage. While indoor self-storage facilities have access to cutting-edge security features such as 24-hour camera monitoring, shed storage might only have a lock to prevent access. In addition, the leading storage facilities are insured against loss, which means that their clients can be reimbursed if their items are damaged while in storage. All the liability for shed storage options is held by the property owner. Indoor storage options are a convenient way to ensure your goods are protected while allowing you to focus elsewhere. You’ll have an experienced team of storage experts watching over your belongings, and you’ll be able to access them securely on short notice. Our expert team can help guide you on all your indoor storage options! To learn more, call us today.